The ‘rich coast’, Costa Rica is a country situated in Central America that enjoys coastlines along both the Caribbean and Pacific Oceans. Tropical rainforests, a multitude of exotic animals, plants, volcanoes and mountains, not to mention the beaches only add to the diversity of the country making it a popular tourist destination. Costa Rica’s tourism is buoyed by the fact that many cruise lines visit the country, using Puerto Limon as a port on the Caribbean side and Puntarenas on the Pacific. Both ports of call offer tourists shore excursions that take advantage of the tropical rain forests and the eco-friendly national parks with tours, zip lines and canopy tours to name just a few. 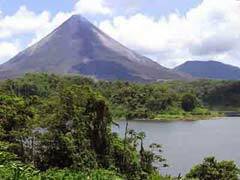 The Arenal Volcano is perfectly symmetrical and until 2010 was an active volcano that used to awe travelers to Costa Rica with its eruptions and lava flow. The volcano is now in a resting phase but no one is sure just how long this will last before eruptions begin anew. The area offers plenty of opportunities for hiking, climbing mountains and taking tours on the rivers. 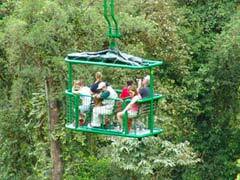 Hot springs, canopy tours, horseback riding tours and hanging bridges make this a great natural attraction. Eco tourism is big business in Costa Rica with many National Parks offering biodiversity, like the Corcovado National Park which offers tourists to Costa Rica all four monkey species that are indigenous to the area. Tortuguero National Park has monkeys, sloths, reptiles, turtles and birds, while the Monteverde Cloud Forest Reserve has over 2000 plants including many different orchid species, over 400 different bird species and 100 species of mammals. All of these parks offer guided tours and the chance to learn and explore about the many animals, birds and plants that are thriving in their natural environments. For those traveling to Costa Rica and visiting San Juan, is Chirripo National Park where visitors can climb to the top of Mt. Chirripo and take in views of both ocean coasts. There are plenty of hiking trails, horseback riding opportunities, trips to go birding and places to camp so you have the choice of visiting for the day or experience the park for days at a time. Travelers to Costa Rica that are a bit more adventurous can take in Tropical Bungee, one of the top 10 bungee jumping sites in the world, located in Naranjo just outside of San Juan. The bridge over the Colorado River is where jumpers zoom into the rainforest, from the base 80 meters above the ravine. Volcan Poas is a smouldering crater that makes for wonderful photographic opportunities and the Gold Museum allows tourists to Costa Rica to see indigenous gold art, sculptures and jewelry right in the Old Town area of the city. Puerto Limon is the port stop for Caribbean cruises that stop in Costa Rica. From here excursions like the Veragua Rainforest Park or Playa Bonita can be had. Veragua Rainforest Park allows travelers to the area to take an open tram ride through the rainforest canopy where you can see monkeys, birds, insects and sloths. There is also a zip line experience and many hiking trails for vacationers to see the rainforest and all of its secrets unfold before their eyes. Playa Bonita is a beach with good swimming and amazing surfing breaks to enjoy, as well as the sandy beach and the chance to relax in the Caribbean sun. Puerto Limon also boasts an incredible open air market with local produce and craft stalls. The town of Limon is just blocks from where your ship docks, so a walking tour of the area is also within reach, as you take a step back in time with the history and culture of the area. On the pacific coast lies the town of Puntarenas where cruise ships dock as part of Panama Canal cruises. Here the shore excursions also celebrate the biodiversity of the area with hanging bridges, rainforest walks, zip lines, horseback riding tours and hiking opportunities through the rainforests. Costa Rica tourists can see the many different species of plants and animals that call the country home with guided tours with knowledgeable and interesting guides. Crocodile encounters by boat, tours of coffee plantations and butterfly gardens tours are also available in the area allowing vacationers the chance to see how coffee is grown and cultivated, what crocs do in the wild and to enjoy the beauty and grace of many exotic varieties of butterflies. Visitors to Costa Rica are blessed with so much biodiversity that is celebrated throughout the land in places that strive to keep the ecosystem healthy and functioning while allowing tourists the chance to see them up close. For natural beauty, many interesting and novel things to see and a tropical climate, nothing beats Costa Rica.